Invite several wrens or chickadees to roost in your garden with these BestNest Classic Hanging Wren Houses. The traditional shape makes each of these homes a perfect roosting spot for small songbirds. A 1.25" diameter entry hole on the front panel allows wrens or chickadees to enter each unit, while preventing larger birds from accessing the home. The pitched, wooden roof overhangs this entry, protecting it from rain and other precipitation. The lapped detailing on these roofs lends depth and dimension to each piece, furthered by their flat bases. This portion may be removed for seasonal cleanouts, so your birds can enjoy the shelter again and again. The wood construction insulates each home, while its light color keeps birds from overheating, and gaps at the top of both the front and back panel ventilate the shelters for avian comfort. Hang these abodes on brackets or hooks using their attached, plastic coated cables, so birds have several roosting options. Add unique shape and timeless housing for a few birds to your backyard sanctuary with these Classic Hanging Wren Houses. 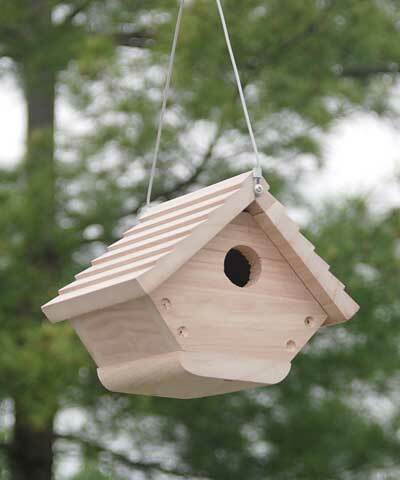 Note: This case pack includes 4 of the BestNest Classic Hanging Wren Houses.